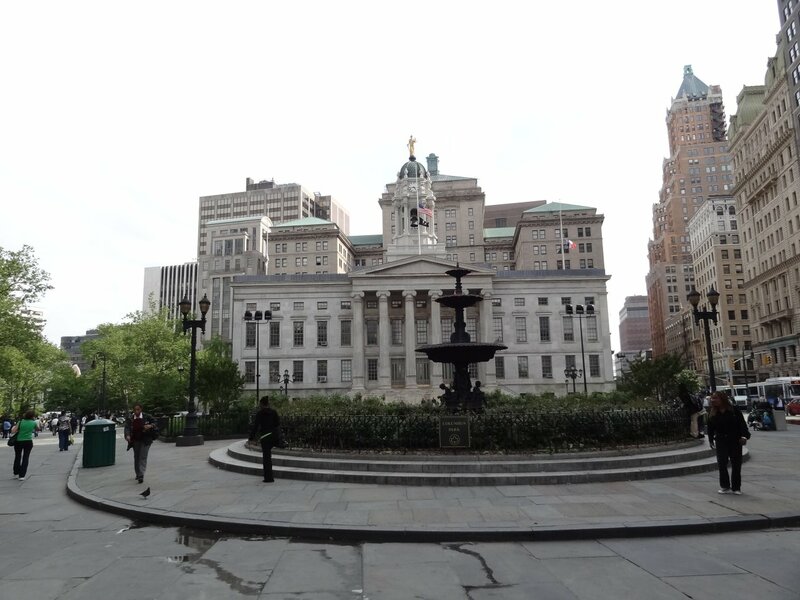 The oldest of Brooklyn’s public buildings, the Brooklyn Borough Hall was designed by architect Gamaliel King and built between 1846 and 1851. Until Brooklyn’s consolidation into greater New York (in 1898), it served as the city hall and housed governmental and judicial offices. Architecturally, it is one of the most splendid of the many Greek Revival buildings that sprang up in Brooklyn during its boom years. Rectangular in plan, it has two stories cadenced above and below by a high basement and a low attic. At the northern end, an imposing Greek portico, consisting of six fluted Ionic columns rising above a flight of steps, commands a view out over Cadman Plaza. The rear and side façades echo this front porticoin low relief. The slightly projecting central bay of the sides is accentuated by pilasters between the windows, which extend the full height of the façade above the basement level. This arrangement is repeated on the two end wings of the rear façade. The present cupola, constructed of cast-iron, was designed in 1898 by Stoughton & Stoughton. It replaces the original wooden structure which was destroyed by fire in 1895.